Khus Khus POSY Hair Serum - Besides the sweet, delicate, divine aroma, one can expect to nourish the hair sealing in split ends with this lovely serum. POSY is a rich serum but without being too heavy, a deeply hydrating hair healing treatment. 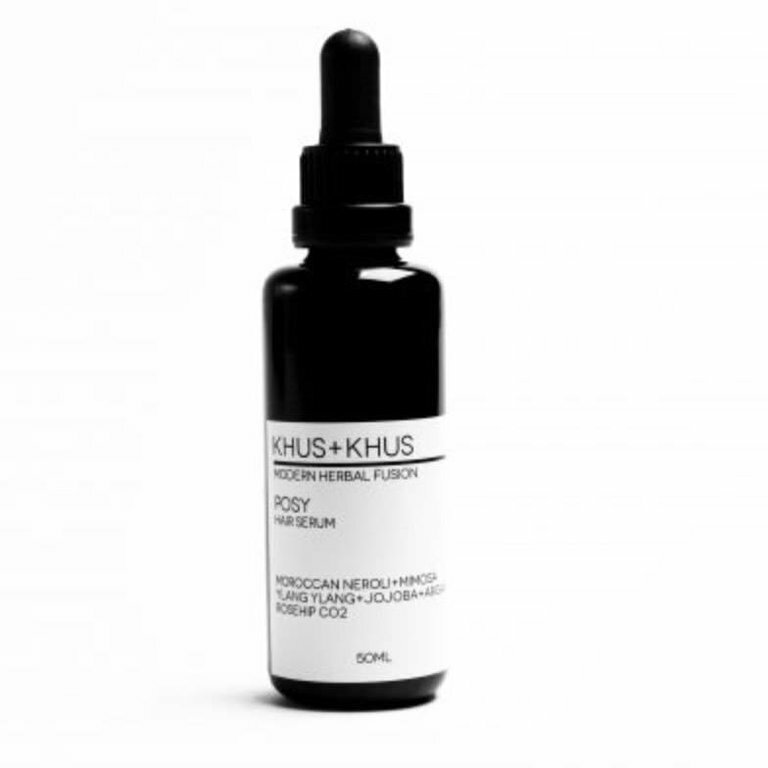 Botanical Therapeutic Actions: Besides the sweet, delicate, divine aroma, one can expect to nourish the hair sealing in split ends with this lovely serum. POSY is a rich serum but without being too heavy, a deeply hydrating hair healing treatment. + The exotic mimosa + neroli combination also has enhancing qualities for shine and protecting the hair. + Ylang Ylang reputed in its ability to treat split ends combined with argan, rosehip and jojoba create body, healthy shine and protect hair from external heat. + Neroli oil regarded as one of the most effective antidepressant remedies and for the reduction of anxiety, with its penetrating floral aroma, sweet + sensual considered one of the most exquisite evocative to be found. + Jojoba used for centuries by the Apache Indians + Indian of Mexico as a scalp tonic, due to its ability to closely resemble the sebum of the scalp, it is ideal for hair products and restoration of damaged, dry hair. It helps prevent an oily scalp + hair loss due to clogged pores. Energetics: Uplifting, but not too much, definitely has a chill factor. Mood stabilizer. Use: Can apply to wet or dry hair. Can also use as an intense hydrating treatment apply from the roots to ends wrap in towel + sleep overnight. For daily use place a small amount in the palm of hand rub + apply to hair paying attention to ends. Can also be used after blowouts to tame frizz + add shine. Due to the consistency, only a small amount is needed.